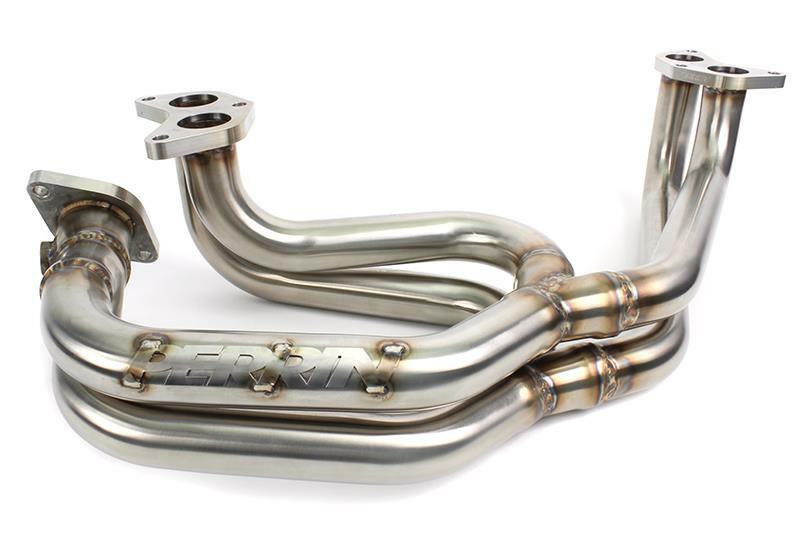 Perrin Equal Length Headers SUBARU - Excelerate Performance - European, Exotic and Japanese Performance Specialists!! Create a smooth sounding exhaust note while increasing horsepower and torque with the PERRIN E4-Series Big-Tube Equal Length Header. The new PERRIN E4-Series Big-Tube Equal Length Header comes with collectors that have been designed for better exhaust flow while allowing the headers to be constructed much more accurately. The improved exhaust flow and more precise construction increases power and reliability. The new E4-Series also has a low-profile design, allowing for lots of ground clearance. The equal length design of the PERRIN E4-Series Header produces smooth, balanced exhaust flow from the heads to the turbocharger giving you the best of two worlds: quicker turbo response as well as more horsepower and torque throughout the entire RPM band. While designed to fit to the factory up-pipe, our header will also mate with an aftermarket up-pipe that fits factory header and turbo, as well as any rotated turbo kits compatible with the factory header. You won’t see grossly over-sized tubing to make our header “look” impressive, this just slows exhaust gas flow and reduces response. This header uses 1.625” primary tubing that is expanded at the flange to fit the Subaru exhaust port size. This size tubing is perfectly designed for cars making more than 500WHP. You can see from our dyno graphs that there is a significant gain in horsepower and torque across the entire RPM band compared to an OEM Subaru header. 2.0L WRX engines will need the 2.5L STI oil pan install kit. Please shop our installation kits for more information.